I had the chance to spend the day at an amazing school in the United Kingdom yesterday in Bolton which is just outside of Manchester. The School, Essa Academy, has been making some news for its use of iPads and was recently featured on the BBC. There is also a profile of the school on the Apple website. While all of this is nice, the thing that makes Essa Academy so impressive is the student-centered building and of course their most impressive resource, the staff and students inside. We felt welcomed immediately upon arrival as we walked down the pathway to the entrance and saw welcomes written on the light posts in a number of different languages. We were also impressed with the large monument of a QR code out in front of the school that directed us to the Essa Academy website. The first thing you see when you enter Essa Academy is the dining area. It is seen as an important gathering space where students and staff share meals and spend time socializing together. When students enter in the morning the first thing they see is their teachers sharing a breakfast and talking to one another. Interestingly, this is the only place in the school where community members eat. There is no separate dining area for staff. In addition there are no departmental meeting spaces. All of the teachers share this large community space to get work done and collaborate. I loved the science labs which featured these large windows so that others could look in and see the learning happening in the lab. Students are also encouraged to use the windows as a board to write formulas and brainstorm solutions to tasks. The classroom spaces are very different from traditional schools in the fact that there is no teacher desk or whiteboard at the front of the room that is the focal point of students. Students work together in groups on different challenges and it takes some time to figure out who the teacher was. The spaces were clearly designed to focus on learners not teachers. While I wouldn't have thought much about the lockers other than the fact that they are more colorful and smaller than what I am used to seeing, the thing that I found interesting was that these were also the spaces where teachers stored their belongings. It was really a joy to see a school built in 2009 that was designed with a student-centered vision! 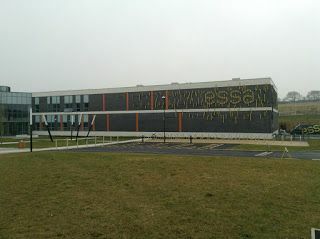 I hope other communities that are fortunate enough to build new schools are as thoughtful as the folks at Essa Academy.